If you spend a lot of time at a computer, then you probably realize how much easier it is to handle text messaging using a browser and keyboard. If you haven't yet explored that option, however, you're missing out. There are many different applications in Google Play that achieve the same end result, but MightyText is easily among the best – it's free, extremely easy to set up, and has both a Chrome extension and tablet app. 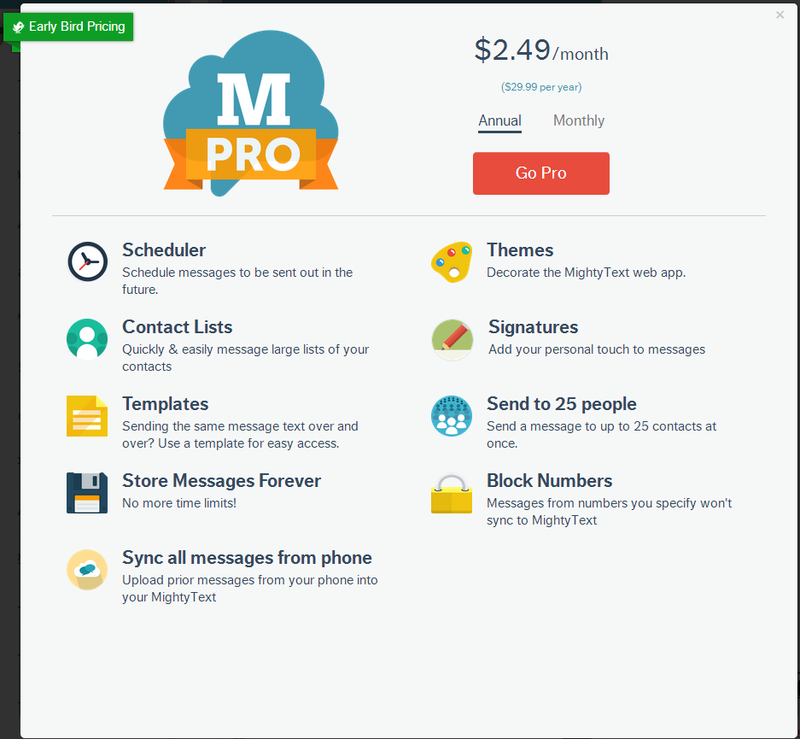 For those who want a little more than just the basics, however, MightyText announced its new Pro plan. This options brings many advanced features to the table, like the ability to schedule messages to be sent later, support for contact lists, templates, unlimited message storage, signatures, bulk messaging for up to 25 people, the ability to block numbers, and themes to make the web interface prettier. For a limited time, you can get access to all the Pro features for $30 if paid yearly ($2.49/month) or $3.99 if paid on a monthly basis. MightyText is calling this "early bird pricing," and has already stated that the price will increase after "a couple of weeks." So, if you want in, this is the time to buy. If you're a user of the free version of MightyText and/or don't necessarily need all the bells and whistles, don't fret – it's not going anywhere. For more information on MightyText Pro or to sign up for the service, check out the official blog post.